Hi all! Today I'm linking up with The Third Grade Nest for a fun Top 10 list! 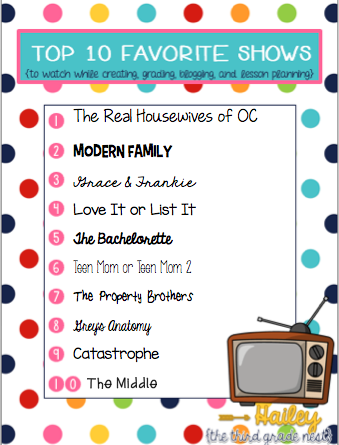 So here are my top ten fave shows to "watch" while working. Obvi, I'm supposed to be working while these shows are on, so I tend to watch mostly reality shows and comedies since you don't have to be paying 100% attention to what's happening to know what's going on. I save the intense dramas for later. ;) Definitely can't watch Game of Thrones while working because you know you'd miss some detail that later a whole show is based on! I'm a total Bravo addict, so basically I watch most of the Real Housewives shows. And then I watch them again when they are rerun, and then again, so these make great background noise while working! Love Modern Family! So, I always watch reruns. I also enjoy reruns of Grey's Anatomy on Lifetime and The Middle too. I cannot get enough of HGTV, so Love It or List It and Property Brothers definitely make the list. In fact, HGTV is on whenever there is nothing to watch. It usually doesn't disappoint. If you have Netflix, you have to watch Grace & Frankie! It's hilarious. Jane Fonda and Lily Tomlin are great! Also, if you have Amazon Prime, Catastrophe, is really cute and funny. Love these original series! Lastly, we have The Bachelorette and Teen Mom. Well, guilty pleasures for sure and I can definitely only halfway pay attention and get the just of it. Perfect TV watching for working- LOL! What makes your Top 10 List? HGTV all the way! I want Fixer Upper here in my house, now! But, I'll also take those twins, lol! Hope you're having a wonderful summer ... can't wait to see your top ten list next month!